Does your handcrafted jewelry shout out, "Wow! Look at me, I'm fabulous!"? If it doesn't, you can change that by changing the way you do things: Stop borrowing designs dreamed up by someone else. Make your own bold clasps, ear wires, and beads instead of relying on manufactured findings. Try a few simplified metalsmithing techniques. Metalsmithing can be complicated, but it's the best way I know of adding a "wow" factor to your jewelry. I've made it a little easier by simplifying a few metalsmithing techniques so you can master them easily. The tools, cost and time you need depend on your design choices. Blades: brands labeled "gold" cost more, but they're easier to work with. Sheet metal of your choice. 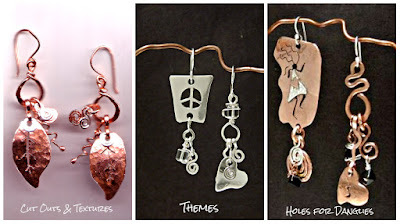 Copper makes wonderful jewelry and it's the least expensive. 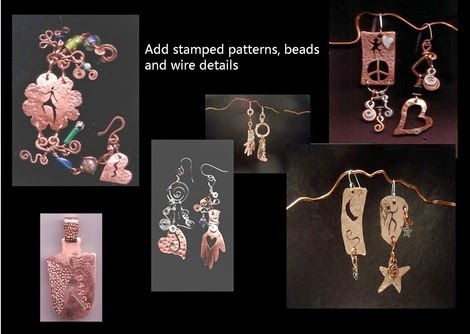 If you prefer to work with silver, gold-filled, gold, or other more expensive metals, start with copper first to hone your skills. If you already have a jeweler's saw, pull it out and practice. 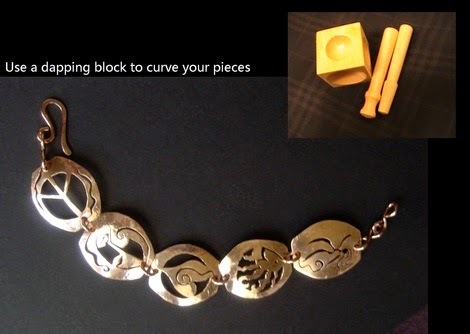 You'll break a ton of blades at first, but eventually, you'll be inspired to create jewelry that's truly unique. Draw your designs directly onto metal, either freehand or with a template; then cut them out with your saw. Use files to smooth rough metal edges. See "Now Cut That Out! 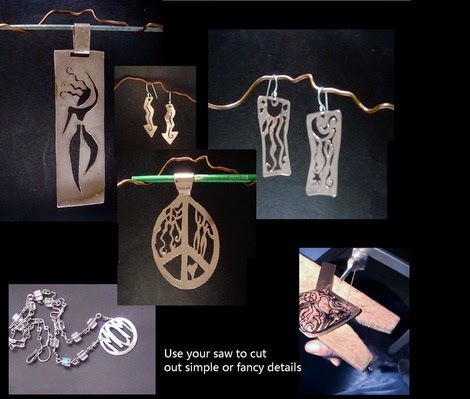 Creating Jewelry With a Jeweler's Saw" for tips. If you'd prefer not to saw, try metal shears. They cut metal the way scissors cut paper, but are best for cutting simple shapes only. A die cutter is a more expensive cutting option. You can buy an inexpensive cutter that's a simple metal block that works like a punch. You add manual pressure to create a simple, uniform shape: circles, ovals, hearts. If cutting metal isn't your thing, but you still want to use metal in your jewelry, search online for "blank metal shapes for jewelry making." With stamping, it takes very little effort to enhance metal with decorative patterns. You can buy textured, patterned, or alphanumeric punches from a jewelry catalog or online supplier. Or you can improvise with interchangeable screwdriver bits or punches you find in a local hardware store. You can also create a pattern on metal by striking it with a ball peen hammer. Select one of the six curved sections on the block. Use a punch to hold your metal piece in place. Strike it with a hammer. One good blow should do it. For metal earrings that are full and dangly, add holes to your metal pieces with a drill or a manual punch. 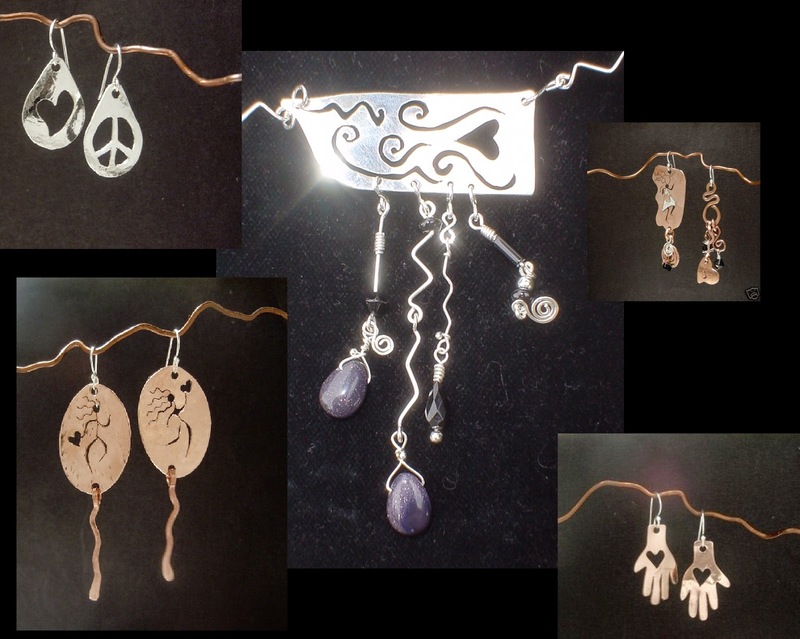 Add ear wires then add figure 8s or jump rings to dangle wire shapes and beads. If you're already comfortable working with a jeweler's saw, take your skills to a higher level. Draw your fantasy design on metal with a fine line marker. Drill or use a manual punch to pierce holes in the sections to be cut away. Insert your blade into one end of your saw, then through a hole. Fasten the other end into place, tighten, and then saw. Leave enough metal in place to hold your piece together. A basic plumber's torch is all you need to generate a flame that's hot and big enough for most jewelry soldering operations. Once you learn basic blowtorch safety, try the simple technique of fusing several layers of metal in a single soldering operation. 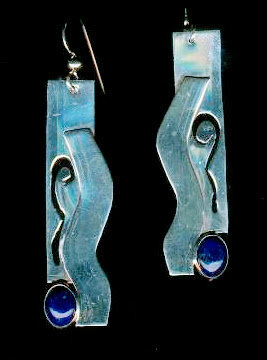 Fuse silver onto silver or layer it with copper, gold-filled or brass sheet or wire shapes for fabulous "wow" pieces. Silver-bearing solder from a hardware store is fine for simple soldering techniques. It flows at low temperatures when you hammer it flat and clip it into small pieces. Use a small paintbrush to add flux to the front and back of metal pieces you wish to fuse together. Use your brush tip to place a pattern of solder chips on the back of each layer. 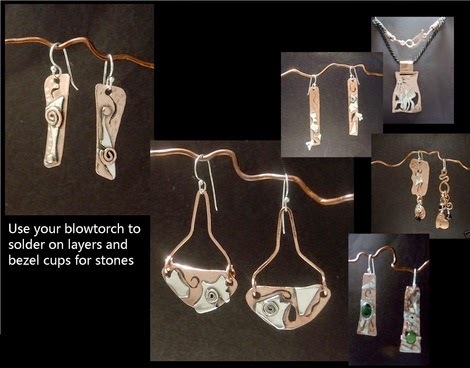 See "Working With Your Blowtorch: Ten Safety Tips Jewelry Designers Need to Know " for more information. When you're striving to be a jewelry making superstar, it's okay to cheat a little. Instead of bezel-setting small stones the hard way, try using bezel cups: calibrated silver metal ovals and circle cups that are form fitted to hold calibrated semi-precious cabochons. Add flux and solder to the back of the cup. Make it the final addition on a layered, fused piece. Don't get frustrated by trying too many new techniques at once. 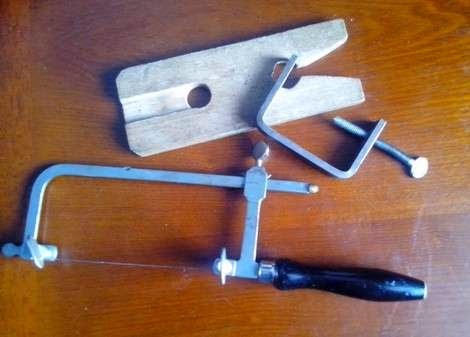 Metalsmithing tools are expensive. Buy only what you really need. Have fun, and don't cut yourself!